New year, new theme. 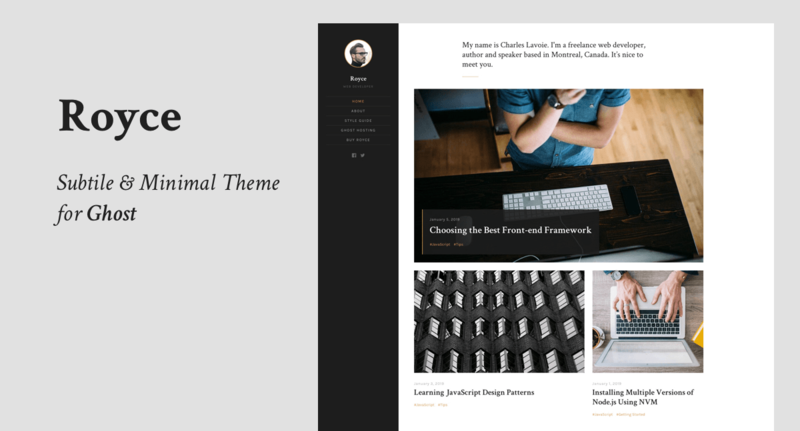 This time it’s Royce, a subtle single-author blog theme for Ghost. This beautiful theme is built for professional writers (Koening editor support), programmers (Prism code syntax highlighter included) or content marketers (SEO optimised with well-integrated sharing experience) who are looking for minimal, resource-light theme designed for efficient reading. Share your ideas and grow your audience. Subscribe to our newsletter and get notified about new themes, discounts and blog posts. © 2019 Just Good Themes. WordPress hosting provided by Cloudways.